The Roomba has a piezo beeper that can play tunes. You’ve heard it. And its motors make noise. Why not put them under MIDI control? 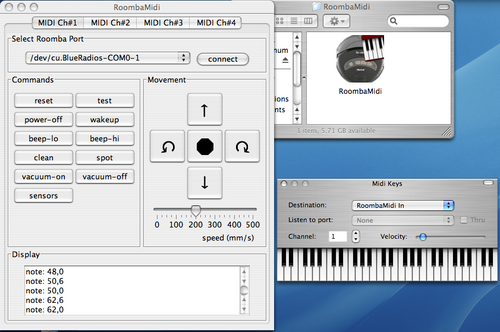 So here is RoombaMidi: a Mac OS X application that creates a virtual MIDI instrument for use by any Mac OS X MIDI sequencer, like Ableton Live, Logic, and so on. If you don’t have a sequencer or just want to play with this quickly, grab the awesome and free app MidiKeys. It’s a little virtual MIDI keyboard. 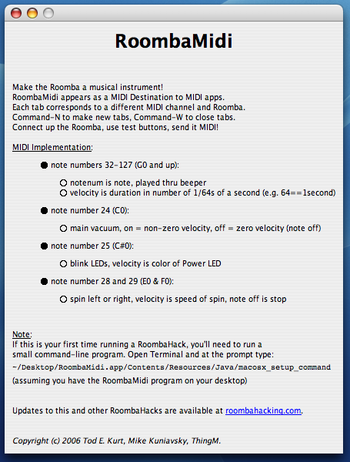 – supports up to 16 Roombas, one per MIDI channel. Other recorded compositions are forthcoming…. I’m no programmer, but I am dying to teach my Roomba the 1812 overature and am a windows xp user. Any tips on how to do this? Additionally, it’s unclear if RoombaMidi will actually work anymore, as Apple has deprecated or removed many of the Mac-specific Java APIs, including the MIDI one, that RoombaMidi relied upon. which is a non-Java version of the same idea. Very cool. I wanna try, but I’m having trouble. I keep getting this…. Any ideas? I’m using Mac OSX. Hi Rich, Thanks. I don’t know what happened, but toggling themes fixed it. I upgraded WordPress on it recently, maybe there’s some new weirdness there. In case you don’t know your Hacking Roomba website is blank when accessed. Won’t Work on my Windows PC. Hey, this is a great hack! I thought I’d pass along an idea. Unfortunately I’ve lost the source code, but back when I was doing J2ME development for my cell phone, I came up with a way to get “simulated polyphonic sound” on a monophonic instrument (in my case, my cell phone). Basically the approach was to use the JMusic library to write a little conversion tool. The tool would time slice a MIDI sequence into 1/64th intervals and then round robin through all active voices as it processed the sequence one note or chord at a time. In other words, a C major chord played for 1/4 note would get turned into C, E, and G played over and over again 16 times in rapid succession. Your brain is tricked into hearing chords (that waver a bit in timbre like an old telephone ringer). It doesn’t work as well obviously when the song you’re playing has a lot of very short interval notes (like real fast 32nd notes and trills), but it still works tolerably well–it doesn’t mangle the song to the point that you can’t tell what you’re hearing.